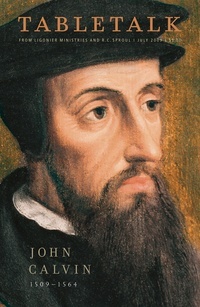 The July 2009 issue of Tabletalk focuses on the ministry and legacy of the great Genevan reformer, John Calvin. Contributors include R.C. Sproul along with Thabiti Anyabwile, Rick Gamble, David Hall, Keith Mathison, Iain Murray, David Powlison, Gordon Reed, Philip Ryken, and Derek Thomas. Tabletalk features articles about topics central to the Christian faith and daily, in-depth Bible studies with featured columns by contributors such as Terry Johnson and Gene Veith.